PS4, PS4 Slim or PS4 Pro: which console is right for you? PlayStation 4 Pro, the most powerful console from the Sony is now available for purchase. However, this new device does not ring the next consoles generation, but it brings noticeable improvements to the gaming experience of the players. The extra power of the Pro version gives the developers the opportunity to get even more out of the games. Above all, the graphics quality should benefit. 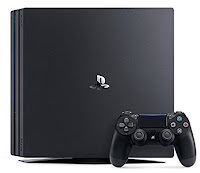 Many of the already released PS4 titles are optimized with updates "PS4 Pro" and offer from now on a 4K up-scaling or even a native 4K resolution. However, all games can continue to be played with the standard PS4 and the PS4 Slim. Therefore, a hardware upgrade is not absolutely necessary. And since the Slim version can be purchased at a lower price than the PS4 Pro, the consideration is appropriate: Which console should I buy. Do I absolutely need the PS4 Pro? You have no 4K TV and no PlayStation VR? And the old PS4 runs still perfectly? Then it's not very lucrative for you to switch to the Pro version, especially if you are an occasional player. Nevertheless, the Pro offers advantages that improve the gaming experience on your screen. We look more closely at the technical data. Before we look into the technical data between PS4 Pro and PS4 Slim, we want to mention three more information about the slim model: compared to the standard model PS4 Slim is 30% smaller, 16% lighter and has one to to 28% lower energy consumption. The main difference is the significantly higher graphics performance. The PS4 Pro comes with a new graphics unit with a rich 3D power. Overall, it should bring 2.3 times as much power as the PS4 Slim. In the "Pro mode", game manufacturers can thus increase the graphics quality and performance. By the way: A new "DualShock 4" controller, which has an additional light bar above the touchpad, is supplied with the console. It can also transfer data via the USB port. Thus the latency is even lower. Is It Worth Buying The PS4 Pro? The biggest sales argument for the PS4 Slim is probably the price. On Amazon you can find the console with 500 GB for $ 297. If you are one of the occasional game players who want to play with their pals a few times FIFA 17, this model is enough. However, if you are prepared for the future and you are ready to take advantage of $100 more for an optimized player experience, our recommendation is for the PS4 Pro. This simply delivers significantly more power, which you are best equipped for the PlayStation VR as well as 4K. If you still have a fully functional standard PS4 at home, no new acquisition is necessary. If you have a 4K TV in the living room and want impressive picture quality, a hardware upgrade should be particularly worthwhile. The PSVR also benefits from the higher performance of the PS4 Pro.